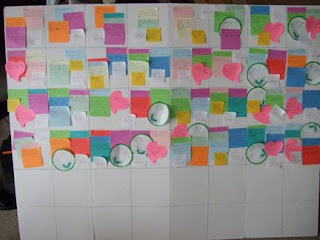 To help track the various threads in my book during revisions, I made a new plot board. It’s probably the most complex I’ve ever made, due to the fact that it focuses on threads I wanted to make sure got their fair share of screentime, as well as plots and subplots. Ah, a thing of beauty and a joy forever. Until, of course, I start digging in there and rearranging stuff. It looks great. I haven’t used a plot board yet, but your previous posts on the subject have been really useful. What are all the circular post-its for? As a certified pantser, I just broke out in hives. LOL! Marie, why? the manuscript is WRITTEN already. Anyone can do this, no matter rhow they write originally. Those are a lot of plot threads! I can’t wait to do this once I’m done with my WIP. Thanks so much, Jen! You made my day! Even if the book is written, my mind doesn’t work in plot boards or any of the other tools others swear by. I love how everyone has such different approaches to the same craft. Herm. Looks like the spamfilter missed one. My curiosity has been piqued, Marie. So when you look at a scene from a book or a movie, can you say “in this scene, the romance/mystery/etc. has been advanced”? I don’t think of this as substantially different than writing an outline. The only tricky part, to me, is deciding at the beginning what scene threads I wish to track. How strange! I haven’t had spam in ages. Jess, I would suggest searching under plot board, or just clicking on the topic heading under the post (or on plot boards in the left hand column of the blog page (“Popular Posts”). Basically, it’s a visual representation of my story, a sort of color coded synopsis. Oh Diana, Diana *sigh* when will you just join the rest of us pantzers and write willy nilly without plot boards? LOL! Wendy, are you teasing me? I can’t tell. People, the book has been WRITTEN. It’s done. It’s sitting in a huge stack on my coffee table. I’m doing revisions! I’m dying to know what the orange plot is!!! It’s all suspenseful seeing it there at the beginning, one brief appearance halfway through, then there at the end. I can’t look at that plot board and not think, that would make for a cool spread sheet. Then I could calculate things, like how many words each character said. Oh it beautiful!!! I just love plot boards.